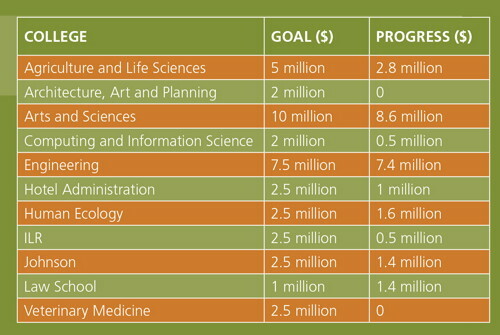 In 2010 President David Skorton announced a $100 million Cornell Faculty Renewal Fund to enable the university to hire 100 new faculty members by 2015, with half the funding coming from philanthropy and the balance from Cornell dollars. Already, alumni and friends have donated $35 million toward the $50 million goal. The fellowships are called the Sesquicentennial Faculty Fellowships. Each of Cornell's colleges and schools has specific goals for each fellowship, and the deans have established plans to shape the colleges' futures with the injection of new faculty talent. Here is an update on progress toward these goals.